Here is my latest edit, Episode 4: Mid Atlantic Bigeye Tuna Fishing. Give it a view and share with anyone who you think would find it cool to watch. Be sure to watch it in HD!! With the perfect weather forecast, we decided we had to give it a go one last time offshore for the season on Maureen Klause’s 27′ Contender Trade In. The ride was perfect all of the way to the SW part of the Baltimore. We started our day pot hopping on the troll when we saw some birds packed in tight and there were some explosive splashed under them. 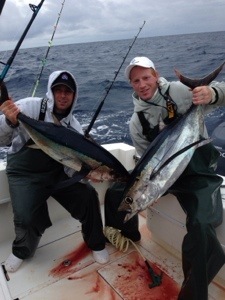 I had to speed up the troll to 8 knots to catch up to the school of tunas but once we went through the school we had 3 25 pound class yellowfin tuna on. We managed to put 2/3 in the boat and got back on the troll again immediately. We saw them pop up two more times but by the time we got to them they had sounded again. We worked the area in the blue-green 67.8 degree water for about another 45 minutes and picked up and ran once we were convinced the fish were gone. We made a 4 mile run down the 100 line until we hit blue 69.5 degree water. We found a set of lobster pot balls and made a few passes. Once we saw there were tons of mahi there, we broke out the spinning rods and started bailing dolphin until we had our fill. Most were small but we managed to get 5 gaffers in the mix. Catching mahi on spinning tackle right under the boat never gets old. 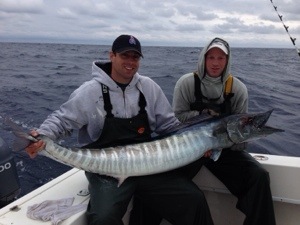 We got back up on the troll and switched over to targeting wahoo working our way down to the Poormans Canyon. 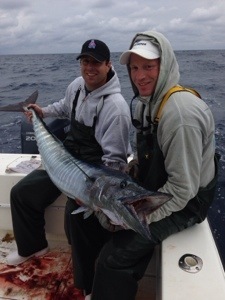 We had a lull for awhile until we had a blue marlin hammer our shotgun bait (a blue/white 8 ounce Joe Shute with a Baitmasters Select Ballyhoo). It made one half hearted jump to show her size then the hook pulled. I cannot seem to have one stay stuck this year. I have had plenty of shots, but 2013 is the cursed year of the blue marlin for me. Oh well, we had a lot of fun today. The addition of a blue marlin release would have been great, but it was a beautiful day on the Atlantic Ocean. 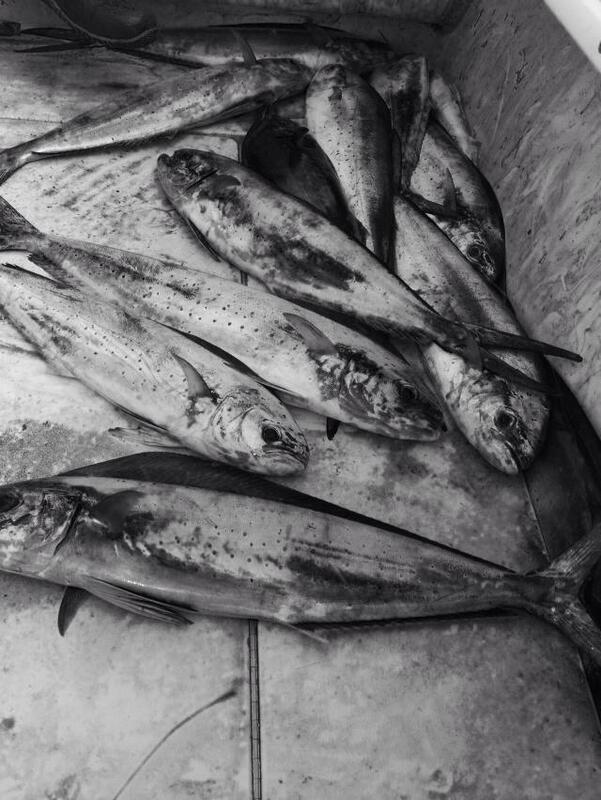 Ran out on the Trade In today out of GE Inlet to line class fish for Makos. It was overcast and in the low 60s all day with wind out of the NE at a steady 10-15. Needless to say, it was a bumpy ride so we started at a trench near the 20 line. The water was green and 64.5 degrees all day, and void of life. After solid NE blow after a week, it was nice to get back out again. Our first drift was for 2 hours and produced nothing, so we rest and made another drift over some structure near the 28 mile wreck area and put in some time there, but no action. Trying again tomorrow.